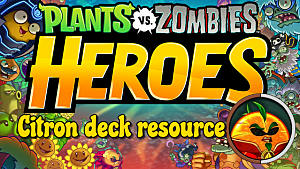 Is she the best-known character in Plants vs. Zombies Heroes? I'd think so, considering she's the first hero the game throws at you. She's the closest you're going to get to "classic" PvZ in the game. Green Shadow is compatible with Mega-Grow and Smarty cards. Between the two she not only has a ton of Plant-buffing power but also the ever-useful ability to freeze Zombies in their tracks. 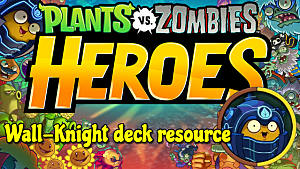 This hero is one of the most versatile in Plants vs. Zombies Heroes. Between the two card types she's compatible with you can easily build decks focused around Pea or Bean buffing or even freezing Zombies and stomping them out with the Winter Squash. Despite being relatively versatile she is severely lacking in defensive cards. Instead there are a number of cards with the Bounce ability to move Zombies or Plants around to manipulate incoming and outgoing damage. It's best to choose between Bean or Pea-oriented decks to make the most of each type's special boosts. Don't try to focus on both as your decks will probably be weaker for it, but do mix in some non-directly synergizing cards to make sure you're prepared for every situation -- and don't forget those cards with Bounce. Attack for 5 damage in the middle lane. Freeze a Zombie. Draw a card. A Plant gets +2 Strength and +2 Health. These combinations are laid out with the most important card bolded and followed by a plus sign (+) with cards the important card will either affect or be affected by. You can look at the card specifics in the tables below this section. Below each combination briefly explains why these cards are good friends. Always remember card synergy when building a deck. 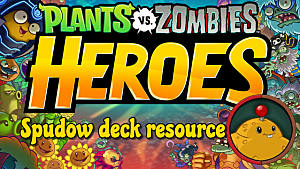 Admiral Navy Bean does 2 damage to the Zombie Hero when you play other Beans. These are all Beans. Bean Counter gains +1 Strength and +1 Health when you play another Bean and adds two 1STR/1HP Weenie Beanies to your hand when played. These are all Beans. Navy Bean grants all Amphibious Plants +1 Strength and +1 Health when played. These are all Amphibious Plants. Snowdrop gains +2 Strength and +2 Health when a Zombie is frozen. These Plants and Tricks all freeze. Winter Squash destroys frozen Zombies. These Plants all freeze. Torchwood grants Peas behind it +2 Strength. These Plants are all Peas. The Podfather grants other Peas +2 Strength and +2 Health when they are played. These Plants are all Peas. Potted Powerhouse gets +1STR/+1HP each time a Plant gains Strength or Health while Potted Powerhouse is still in your hand. These Plants all buff either themselves or other Plants. Party Thyme allows you to draw a card each time another Plant does a bonus attack. These Plants all do bonus attacks. Party Thyme allows you to draw a card when a Plant does a bonus attack and Bananasaurus Rex gains +1 Strength and +1 Health when you draw a card. 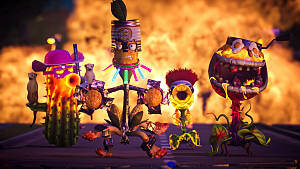 The other Plants here do bonus attacks, and Tricks synergize. Don't ignore these cards if you have them! These cards may not all have synergy on their side like the ones mentioned above, but they are notable and worth considering adding to your decks. Shellery - One of the few offense-oriented cards with Team-Up. Shellery's 1 Sun cost and 2 Strength plus Team-Up is a nice deal for a lot of teams. Cattail - A reasonably powerful Amphibious card, with 3 Sun cost, 3 Strength, and 2 Health. It may not synergize but it's an easy and safe water card for when you need a quick fix. Rescue Radish - A 3/4 Root with 3 Sun, Rescue Raddish may not seem like much until you need to save an important Plant from harm's way. He's really not bad at all. Carrotillery - Another rare offensive-use Team-Up card. A worthy addition to most decks. Iceberg Lettuce - A 1 Sun cost card that immediately freezes a Zombie. Useful, cheap, and a must-have for freezing decks. Sweet Potato - She only cost 1 Sun, she has 3 Health, and she moves a Zombie to her lane when played. She's got her uses, and those uses are all saving your more important Plants. Doubled Mint - If you can keep this card alive long enough to see it reach its potential, it can be the highest damage card in your deck. A good opponent will take it out before it gets that way, but if you get lucky Doubled Mint is a real beast with its every-turn Strength and Health doubling. Fire Peashooter - This is a 2 Sun cost, 3 Strength, 2 Health card. That's very strong for early game, and even better a bit later with a Torchwood supporting it. Muscle Sprout - This bad boy gains +1 Strength and +1 Health when you play another Plant. If you play this on its own during the early phases of a game your opponent will probably destroy it immediately, but if you play it when you have enough Sun to play multiple Plants in a turn it will have a great head start to whompville. 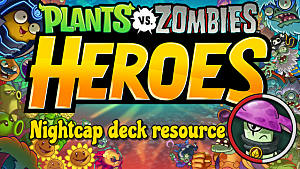 Super-Phat Beets - Play this guy when the whole board is stacked and watch his stats grow! A great mid to lategame card. Espresso Fiesta - (Trick) If you want one really hard-hitting plant to really whomp on a particularly though Zombie or give the Zombie Hero the what-for, this is your Trick to play. Whipvine - An important card when you are trying to protect steady growers like Double Mint and Muscle Sprout as it lets you move a Zombie when played. Good stats and utility. Brainana - If you want your opponent to have to take a break for a turn, this is the card to play. Brainana drains all their brains, and with their brains go their ability to do much. An amazing stalling Plant should you need it. Winter Melon - It's a freezing Plant with Splash Damage 4! The only downside here is its cost is 7, but if you've got a lategame deck (and a Winter Squash to spare) it's an amazing lategame card for most situations. The Great Zucchini - Just in case you really want to be sure every Zombie dies to your next amazing play, The Great Zucchini goes ahead and transforms every Zombie into useless 1 Strength/1 Health Zombies cannon fodder. An amazing card you should definitely have in your deck if you have it. 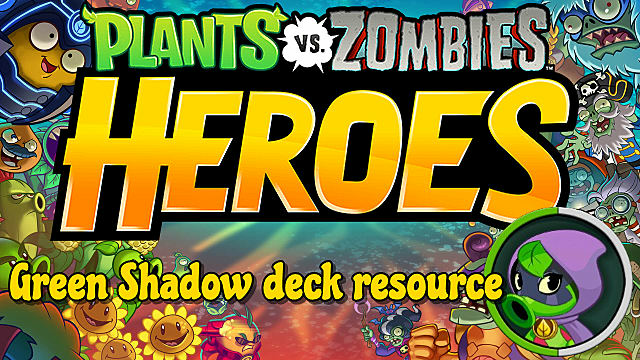 Below are all the Mega-Grow and Smarty cards currently available in Plants vs. Zombies Heroes that you can use with Green Shadow. There are separate tables for Plants and Tricks. A card's rarity is noted next to their name in parenthesis. The more rare a card is, the less likely you are to get it from a pack and the more it costs to craft. The rarities are Common (C), Uncommon (UC) , Rare (R), Super Rare (SR), and Legendary (L). Bonk Choy (UC) Leafy When played: This gets +1 Strength this turn. Party Thyme (UC) Leafy When a Plant does a Bonus Attack, draw a card. Pea Pod (C) Pea Start of each turn: This gets +1 Strength and +1 Health. Sweet Potato (UC) Root Team-Up When played: Move a Zombie from another lane to here. Torchwood (C) Tree Team-Up Peas behind this get +2 Strength. Black-Eyed Pea (R) Bean Pea This gets +1 Health and +1 Strength when a Zombie Trick is played. Cabbage-Pult (C) Leafy When played on Heights: This gets +1 Strength and +1 Health. Doubled Mint (L) Leafy Start of Turn: Double this Plant's Strength and Health. Grow-Shroom (C) Mushroom When played: Another Plant gets +2 Strength and +2 Health. Muscle Sprout (SR) Leafy This gets +1 Strength and +1 Health when you play another Plant. Repeater (C) Pea After combat here, this does a Bonus Attack. The Podfather (R) Pea When you play another Pea, that Pea gets +2 Strength and +2 Health. Bananasaurus Rex (L) Banana Animal This gets +1 Strength and +1 Health when you draw a card. After combat here, this does a Bonus Attack. 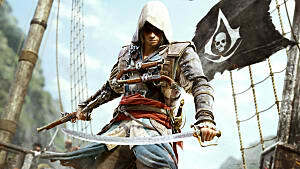 Re-Peat Moss (C) Moss When you play a Trick, this does a Bonus Attack. Skyshooter (UC) Pea When played on Heights: This gets +2 Strength and +2 Health. Potted Powerhouse (SR) Leafy While in your hand: This gets +1 Strength and +1 Health when a Plant gains Strength or Health. Whipvine (UC) Vine When played: Move a Zombie. Super-Phat Beets (R) Root When played: This gets +1 Strength and +1 Health for each other Plant and Zombie. Fluorish (C) Draw two cards. Fertilize (C) A Plant gets +3 Strength and +3 Health. Plant Food (R) A Plant gets +1 Strength and +1 Health then does a Bonus Attack. Espresso Fiesta (SR) A Plant does three Bonus Attacks. Admiral Navy Bean (C) Bean Amphibious, Team-Up When you play another Bean, do 2 damage to the Zombie Hero. Snowdrop (C) Flower This gets +2 Strength and +2 Health when a Zombie is frozen. Snow Pea (C) Pea When this hurts a Zombie, Freeze that Zombie. Chilly Pepper (UC) Pepper When played: Freeze a Zombie. Rescue Radish (UC) Root When played: Bounce another Plant. Bean Counter (SR) Bean This gets +1 Strength and +1 Health when you play another Bean. When played: Add two 1 Health/1 Strength Weenie Beanies to your hand. Navy Bean (UC) Bean Amphibious, Team-Up When played: All Amphibious Plants get +1 Strength and +1 Health. Winter Squash (R) Squash When a Zombie becomes frozen, destroy that Zombie. Jumping Bean (R) Bean When played: Bounce a Zombie. Threepeater (C) Pea Attacks here and next door. Brainana (SR) Banana Amphibious When played: The Zombie Hero loses their Brains. Winter Melon (L) Fruit Splash Damage 4 When this hurts a Zombie, Freeze that Zombie. 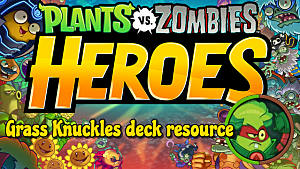 The Great Zucchini (L) Squash Amphibious When played: Transform all Zombies into 1 Health/1 Strength Zombies. Iceberg Lettuce (UC) Freeze a Zombie. Sow Magic Beans (R) Shuffle four 4 Strength/4 Health Magic Beanstalks into your deck that cost 1 Sun and say "When played: Draw a card." Spring Bean (C) Bounce a Zombie. And that's about all there is to say about the mysterious Green Shadow's arsenal! Hopefully this guide helps you on your way to building a more effective team for her and climbing the ranks with it. If you enjoyed this guide and would like to see other heroes given the same treatment, worry not! 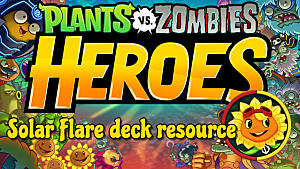 Every Plant hero in Plants vs. Zombies Heroes is getting the same treatment. 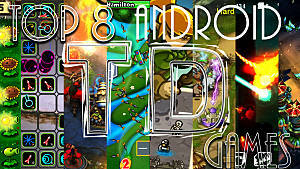 As a matter of fact, here are the links to a few. The others are in progress!